PITTSBURGH (AP) — Jim Rutherford celebrated a new contract in the most expected of ways: by putting together a trade he hopes will jump-start his struggling team. The Pittsburgh Penguins general manager signed a contract extension on Wednesday that will keep him with the club through the 2021-22 season. Moments later he dealt forward Carl Hagelin to the Los Angeles Kings for forward Tanner Pearson. All of it unfolded as Penguins captain Sidney Crosby skipped practice while being evaluated for an upper-body injury. Just another busy day for the 69-year-old Rutherford. The only general manager to win Stanley Cups with multiple teams in the expansion era remains fervently committed to his job, which is why he didn’t hesitate to make a trade that sent the speedy but slumping Hagelin to the Kings for the younger Pearson, the first of what could be several moves as Pittsburgh tries to shake itself out of a 7-6-3 start. “Despite the fact it hasn’t been a happy couple of weeks with the Penguins as a whole, I’m very happy to be staying and will do my best to fix it,” Rutherford said. The Penguins hired Rutherford in the summer of 2014 to replace Ray Shero. Under his guidance, the Penguins revamped their roster and their coaching staff, surrounding Crosby and Evgeni Malkin with a talented group that helped Pittsburgh become the first franchise in nearly 20 years to win consecutive Stanley Cups in 2016 and 2017. Hagelin scored the empty-net goal that clinched the 2017 Cup, racing down the ice in the final seconds of Game 6 to set off a giddy celebration on the bench. Yet Hagelin’s production dipped last year. He finished with just 10 goals — the fewest in his career in a season in which he played at least 65 games — and had just one goal this year before the trade was announced. Hagelin is in the final season of a contract that pays him $4 million annually. Pearson, 26, has two more seasons left on his deal that is worth around $3.75 million per year. Pearson has averaged 40 points in each of the past three seasons, but had just one point — an assist — in 17 games with the Kings this season. He could be available as early as Thursday night when the Penguins host Tampa Bay. The Penguins could certainly use a boost. They have dropped five of six, the longest extended slide of Rutherford’s largely successful four-plus year tenure. The man nicknamed “Trader Jim” for his aggressive approach to addressing problems insists he still has plenty of juice left to keep going even as his 70th birthday approaches in February. It’s a far cry from the day he was hired when he said he anticipated working a few more seasons. For now his attention is focused on helping the star-laden Penguins emerge from another early malaise. 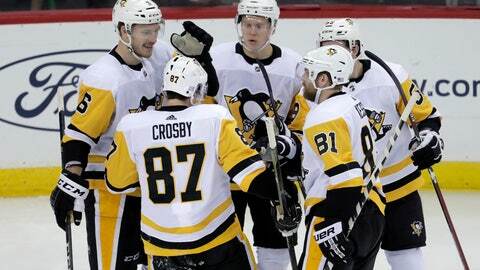 Crosby played more than 21 minutes and didn’t miss a shift during Tuesday night’s 4-2 loss to New Jersey. His absence at practice on Wednesday was a surprise, though Sullivan offered few details. It doesn’t appear to be a long-term problem, however, though Pittsburgh’s issues are far larger than just health. They are having trouble preventing goals and the offense for once isn’t picking up the slack.